Sexual encounters between a son and step-mother. Influences of secular sects and temple prostitutes. Misunderstandings on the handling of sacrifices and treatment of the Pastor. Questionable practices surrounding the protocol in public meetings. People speaking out of turn and in undesirable ways for worship services. Misdirected mindset in the observation of Lord's Supper. Man... If there could be something to go wrong in a local church, the church at Corinth had it covered. Pastor McGhee, a beloved brother and blog buddy, has been sharing comments about his exposition of 1 Corinthians for the benefit of his congregation. It caused me to reflect our study of the same bible book on last year. 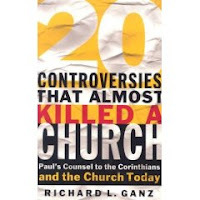 As a backdrop, we used a book by Richard Ganz entitled "20 Controversies that Almost Killed a Church." I will be the first to admit it is not the most "scholarly" book as relates to the typical "commentary" we usually come to expect of well know and respected theological minds. However, it does present the church and it's problems in a real and relevant way. I thought I would share it as a suggestion to those of you who would like a relatively user-friendly read on the book of 1 Corinthians. When my Pastor preaches out of Corinthians he reiterates over and over again as if he can see the question on our faces...what kind of people were they, that had all of these issues? His response was always..."Paul is speaking to CHURCH FOLKS yawl!!" Sound as though this is a good and necessary read especially in times like these. Thanks for suggesting it. That's what I'm talking about!! Great to hear from you. Thanks for the recommended read. I will be sure to pick this up! Thanks for the book. This is a must read! I will be sure to add it to my library! It seems like sometimes we all pastor in Corinth!! I am looking forward to adding that book to my library as well. That's what I mean, get back at it my friend. Why am I not on your blog roll? There seems to be a pattern in the pulpit of expositional passages to preach. After our sermon series on supporting the church, God willing, I'm starting a sermon series in 1 Corinthians as well entitled: "Order in the Church (A Call to Orderly Church Worship)". Thanks for the confirmation.